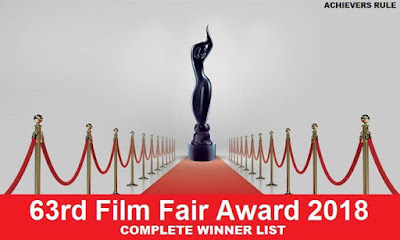 Today we are providing you the Complete Winner Lists of 63rd Film Fair Award 2018 in PDF Files. These PDF Files will Help you to download and uselful for upcoming all SSC & Banking Examinations. In most of the recent trends 2-3 Questions were asked from Awards & Honours. Before that Download the below PDF & Share this PDF with All Aspirants.